Photosynthesis is a biological process mediating the conversion of solar energy into chemical energy. The so-called oxygenic photosynthesis, performed by plants, algae and cyanobacteria, is one of the most amazing chemical reactions on the planet. It provides food and energy for nearly all living organisms, and also contributes to the formation of the atmosphere and maintenance of the carbon-oxygen balance on the earth. In plants, the primary light reaction of photosynthesis initiates at photosystem II (PSII), a membrane-embedded supramolecular machine responsible for catalyzing the water-splitting reaction. Surrounding the PSII, a number of peripheral antenna complexes dynamically associate with it to form the PSII-LHCII supercomplexes of variable sizes in response to different light conditions. The C2S2M2-type supercomplex is known as the largest stable form of PSII-LHCII supercomplex isolated from Arabidopsis and pea so far, and crucial for plants to achieve optimal light-harvesting efficiency when they grow under low light conditions. 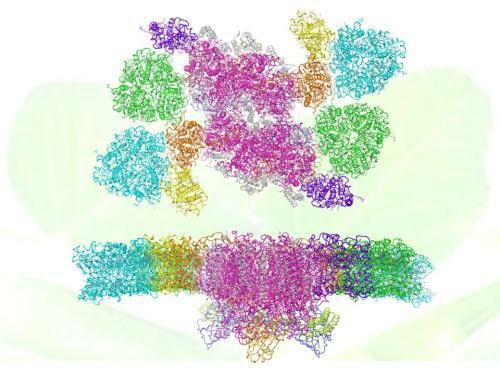 Structural analysis of the C2S2M2 supercomplex is a pivotal step toward our understanding of the molecular mechanisms underlying the processes of light harvesting, energy transfer and PSII functional regulation in plants. CHANG Wenrui-LI Mei's group, ZHANG Xinzheng's group and LIU Zhenfeng's group from the Institute of Biophysics (IBP) at CAS collaborate and solved two cryo-electron microscopy (cryo-EM) structures of C2S2M2-type PSII-LHCII supercomplex from pea at 2.7 and 3.2 Å resolution, respectively. The 2.7 Å resolution structure of C2S2M2 supercomplex represents the highest resolution structure of membrane protein complexes solved through single-particle cryo-EM method so far. The supercomplex has a total molecular mass of 1.4 megadalton and forms a homodimer. Each monomeric PSII-LHCII contains 28 or 27 protein subunits, and binds 159 chlorophylls, 44 carotenoids and numerous other cofactors. The overall structural features and the arrangement of each individual subunits, as well as the sophisticated pigment network and the complete energy transfer pathways within the supercomplex have been revealed in great details through this study. In addition, comparison of the two C2S2M2 structures solved at different states suggested the potential mechanism of functional regulation on the light-harvesting process and the oxygen-evolving activity of plant PSII. The research work, entitled "Structure and assembly mechanism of plant C2S2M2-type PSII-LHCII supercomplex", was published in Science on Aug. 25, 2017. The breakthrough is achieved through continuous and persistent efforts by the team from IBP after their previous work on the cryo-EM structure of spinach C2S2-type PSII-LHCII supercomplex was published on Nature last year. The project was supported by grants from the Chinese Academy of Sciences, the Ministry of Science and Technology of China, the National Natural Science Foundation of China and "National Thousand (Young) Talents Program" from the Office of Global Experts Recruitment in China. Centenarians' end-of-life thoughts: is their social network informed?